Who doesn&apos;t love a little bling from time to time? Melissa Gorga is satisfying our fix to sparkle with the second wave of her jewelry line, The Melissa Gorga Collection for HSN, which debuts on March 26 at Hsn.com. The feisty Real Housewives of New Jersey star, 35, delivers her new 18-piece set of earrings, bracelets, and necklaces galore, which all cost less than $70. "We had such success with the first collection that I really built upon that, and also listened to the feedback I got from my fans," Gorga told Us Weekly of her signature line. 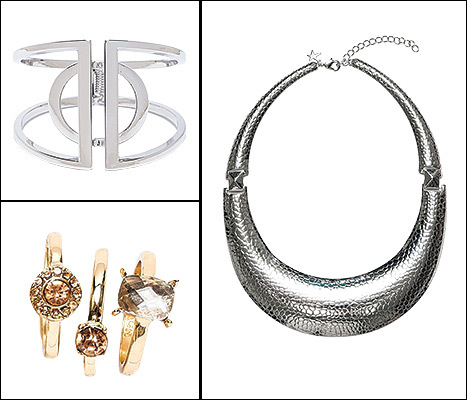 In an age where diamond and platinum jewels rule on the red carpet, going for more cool-toned jewelry was a no-brainer. "They wanted to see more silver, so I am giving them more silver," Gorga said. The Melissa Gorga Collection (all less than $70, hsn.com) includes a cuff ($40), necklace ($30), rings ($30 for five) and chain ($45). The fashion darling relied on her fans for aesthetic input, but also did her own research for inspiration. "I also like to make sure that my looks are on trend, so I look for inspiration from the high fashion runway shows," Gorga told Us. "I add my own bold twist to the design and aim to make it reasonably priced." On top of the wallet-friendly price, the fashion-forward accessories come with yet another perk — how does going from a business meeting straight to a hot date sound? "It’s very important to me to make sure the jewelry is versatile and can go from day to night," she said. "I really look for the pieces to fit into a woman’s lifestyle so you can go to the office, drop off the kids, go to a party and still be able to wear it."